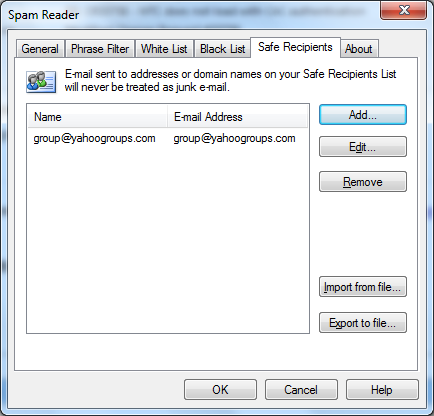 On Safe Recipients List tab of Spam Reader options, you can view and edit your Safe Recipients List. The list items may be names, e-mail addresses or entire domains and can contain wildcards. You can sort Safe Recipients List in ascending or descending alphabetic order. Click once or twice on the corresponding column header to order the list items. Add a new contact. Click "Add..." button to add a new contact to Safe Recipients List. The following dialog window will appear where you can enter a new contact. To add a single contact you need to enter both the name for the contact and the SMTP or Exchange e-mail address. 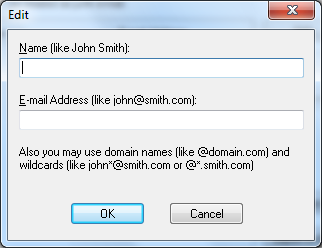 When adding a new contact you can use wildcards both in the name part and the domain part of the e-mail address (e.g. John*@spam-reader.com or JohnSmith@*.com ). Wildcards can be also used in domain names. Remove a contact. Select one or more contacts you would like to remove and click "Remove" button. Edit a contact. Select a contact you would like to edit and click "Edit" button. Import contacts . Click "Import from file" button to import contacts to Safe Recipients List from a text file. In the displayed window specify the text file for importing the contacts. Export contacts . Click "Export to file" button to export contacts from Safe Recipients List to a text file. In the displayed window specify the text file for exporting the contacts.